It’s a box on the top left of the mixing console – sitting alongside a copy of The Dark Horse Years box set, a previous Harrison collection (on the right). There’s also some sort of test pressing leaning up against the cartoon George Harrison character in the photo. 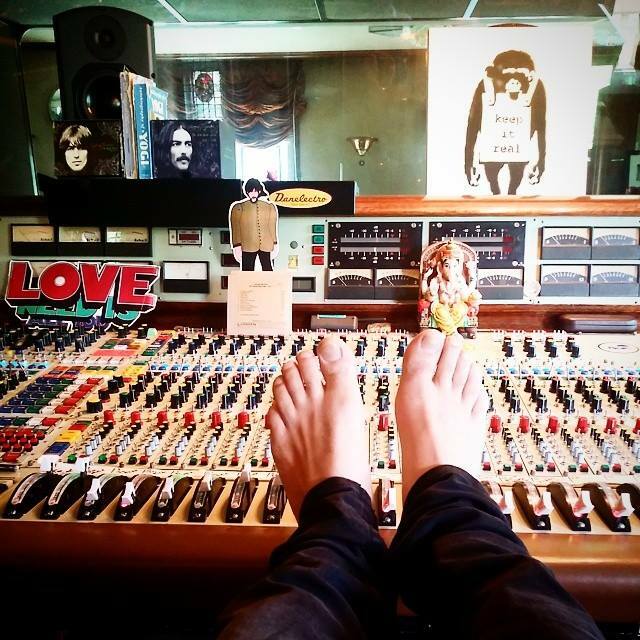 Dhani Harrison later confirmed that indeed he has been working on re-issues of the first seven Apple Records solo albums by his father – something he described as “a lot of work…”. There’s now debate and speculation about exactly what this might mean. Will it include Electronic Sound (which technically wasn’t on Apple but on the Zapple label)? 1. Wonderwall Music; 2. Electronic Sound; 3. All Things Must Pass; 4. The Concert for Bangladesh; 5. Living in the Material World; 6. Dark Horse; and 7. Extra Texture (Read All About It). No other details – but the site does mention a DVD is part of the set as well. 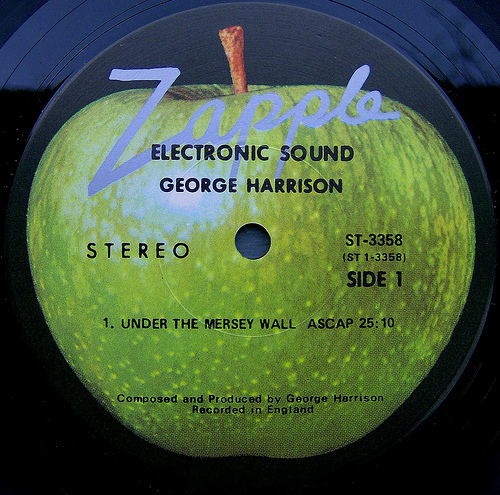 This entry was posted in Apple Records, Beatles, Beatles Collecting, Beatles Music, George Harrison and tagged Apple Records, Apple Reissues, Beatles, Beatles Collecting, George Harrison, The Apple Years by beatlesblogger. Bookmark the permalink. Well really whetted the appetite now! Pleased to have found your blog – I’ll be back. Regards from Thom at the immortal jukebox (plugged in now). All I have to do is locate a moderately priced original LP of Extra Texture in decent condition and my vinyl set of the first seven original Harrison LPs is complete. I’m good! Jeep was the Clapton’s dog but my favorite Apple Jam tune is Thanks for the Pepperoni! Hey – great news about the George box set! Have been trying to source ‘All Things Must Pass’ for a while, though still want it on first-edition vinyl… Must save up some money (*pauses to count all the Beatle-y things on her wishlist*)! Nice to see another Australian Beatles blog out there! I’m a teenage girl from Adelaide, so I find out about a lot of Aussie happenings on here! Thanks for your feedback and your enthusiasm for all things Beatle. Congratulations on your blog and keep up the good work! Great I’ll suscribe to your blog!